It’s Day 12 of our Home for the Holidays … Gluten-Free Style event and today Brittany (Real Sustenance) shares her Cinnamon Chocolate Babka Bread. Okay, perhaps if you’re like me, you had never heard of Babka, but when you took one look at Brittany’s photo, you knew you wanted some of this bread. Immediately, if not sooner! Is that not one of the most beautiful gluten-free recipes you’ve ever seen? Now if you’re familiar with Babka, you’re probably very surprised to see a gluten-free version. Brittany says her recipe is the very first gluten-free version and I absolutely love that she shared it for our holiday event. Incidentally, Brittany is teaming up with Iris (The Daily Dietribe) to write two Essential Gluten-Free Baking Guides. Some amazing recipes have been coming out of both their kitchens for many months now. Can’t wait to see their two guides that will be released in March! Beyond Babka and Brittany and Iris’ collaboration on their new cookbooks, there’s more exciting news … Brittany is giving away three books that are being offered for the first time during our holiday event! 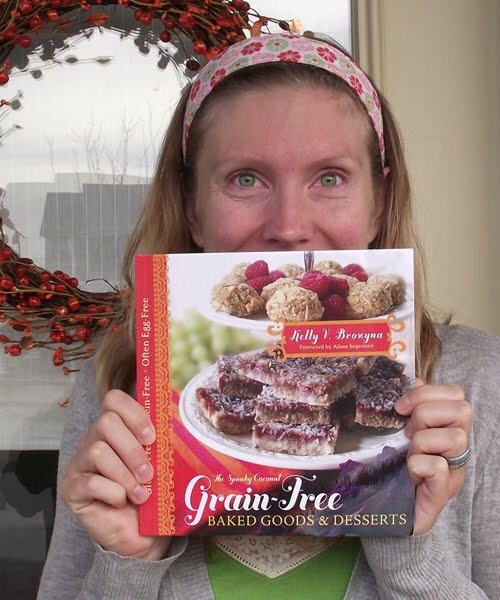 First, there’s Kelly Brozyna’s Grain-Free Baked Goods and Desserts. This cookbook is Kelly’s second. With the emphasis on sweet recipes—but still gluten free, dairy free, casein free, and refined sugar free—this cookbook is the perfect complement to Kelly’s first cookbook, the “all-purpose” The Spunky Coconut Cookbook, which is now in its second edition. You can see my write-up here, including my review of her famous Bean Cake. Incredible grain-free cake recipe that is made from white beans. White beans are certainly an easy and inexpensive way to “super charge” a gluten-free cake IF one thinks of the idea to begin with. Kelly is a very creative cook and the taste of this cake (and several other recipes) is incredible! Incidentally, if you’re looking for some amazing edible gift ideas, Kelly has them for you on her blog … complete with printable recipe gift tags. Check out her Chocolate Hazelnut Spread gift idea. Anyone would be super lucky to get that as a gift. I love both the recipe and the presentation! 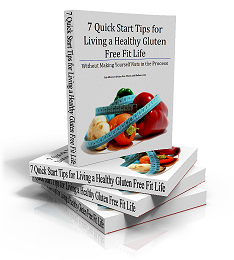 Second, there’s 7 Quick Start Tips for Living a Healthy Gluten-Free Fit Life from Erin Elberson. Erin blogs at Gluten Free Fitness and Nutrition and has an extensive background in nutrition and physical therapy. I reviewed her book earlier in this post. She even included a brilliant adaptation of one of my recipes in her book. Her book is not a cookbook though. It’s more about getting started living gluten free (or restarted if necessary) with common sense wisdom and guidance, that just happens to have several of Erin’s “non-recipes” included. FYI: A non-recipe is one that Erin says is so simple that it doesn’t need a recipe. I love that approach and aspire often to that type of cooking. Erin’s book is really a great way to get started living gluten free the healthy way (or to revisit how you’re eating gluten free). Note that Erin’s book is also available via Kindle. 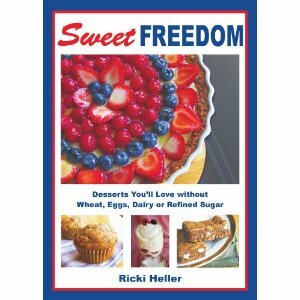 Last, one of Ricki Heller’s cookbooks, Sweet Freedom, sweetens the pot! I wrote about Ricki’s cookbook in the same post as the previous book by Erin. While Ricki eats gluten free now, she did not when writing this cookbook, so not all recipes are gluten free. They are wheat free, dairy free, and refined sugar free though, and many are gluten free or easily adapted so there’s still plenty to be happy about! Also, since I did my review of Ricki’s cookbook, it won honorable mention in the 2010 Cuisine Canada Culinary Awards and also got Ellen’s (yes, that Ellen!) endorsement on her new website—both very cool and well deserved! I’ve written about Ricki and her various cookbooks a number of times here on gfe … Ricki and her recipes never disappoint. Brittany’s giveaway ends Saturday, December 10th, at noon PST. Please head over to her post to enter! A very important reminder to all … every entry during this entire Home for the Holidays event is also an entry for the final giveaway: third prize, a Caveman Cookies gift package ($89 value); second prize, a $150 Free From Gluten shopping spree; and the grand prize, the Vitamix 5200 Super Healthy Lifestyle package! But wait, there’s more … throughout the remainder of the event, I will occasionally be tallying all the entries and running the numbers through random. org to give away some additional prizes. For example, today I “drew a name” and identified a winner for organic coconut oil from Tropical Traditions. Note that these are very quick turnaround giveaways. I’m announcing them on Facebook and/or Twitter and then once a winner is chosen, s/he will be contacted via email and must reply pretty quickly or a new winner will be selected or the offer will be withdrawn. You don’t want to let either of the latter two situations occur so check your email regularly! Finally, do you know about Jules (Jules Gluten Free Flour and Jules Speaks Gluten Free) radio show? She has an excellent 30-minute long weekly radio show called Gluten Free Voice. You’ll want to tune in every Thursday at 7:00 pm EST or catch the podcast after the fact. 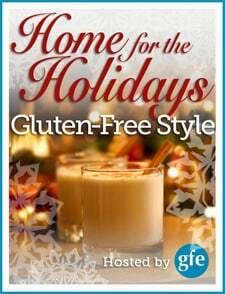 Today Jules featured me on her show talking about—what else?—our Home for the Holidays … Gluten-Free Style event. You can hear that podcast here. (If you’re not familiar with podcasts, they’re basically just an archived recording; nothing else special is needed to listen.) Listen while your cookies are baking, you’re writing Christmas cards, or wrapping presents. I loved Jules’ story about her grandmother’s Cinnamon Sticky Buns (coming soon to our holiday event!). It’s the kind of family story that we all can relate to, and you’re not likely to find that cute tale on her grandmother’s tradition repeated elsewhere! Hi Iris–My pleasure! I can only imagine your excitement, dear. 🙂 So happy for you and, oh my goodness, have you girls worked hard for these books! Will be thinking about you as you get together for the final effort this week! I agree…thank you!!!! It’s so fun to follow, and get to know new gf blogs too. It’s a lot of work, I’m sure, but we really appreciate it!! Thanks for this. I might have celiac and I’m currently lactose intolerant. So, this would be great. Hi Heather–You’re welcome. 🙂 Glad you are finding our event helpful! Remember to comment on each daily blog to enter the giveaways. 🙂 You can see the complete listing with all the links here. You are on fire,lady! What a great event you have organized! Thanks for your kind words, and I look forward to learning the winner! Definitely looking forward to this book. 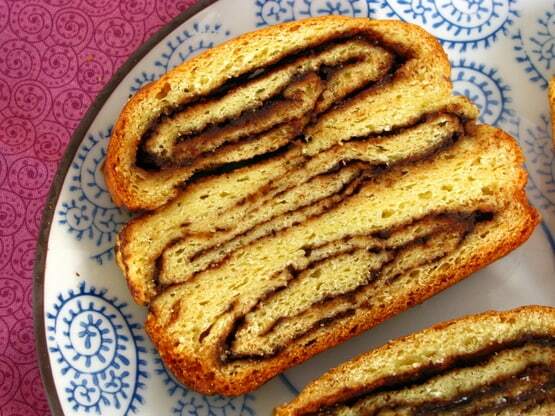 Babka is a favorite! What a great bunch of resources!! Thanks for everything!! Soooo excited! Can’t wait to check all the references out! Wow, your Babka looks great. Can’t wait to try it. Thanks. This looks like its gonna be a family favorite!! Shirley, I never thought I’d hear of a gluten-free babka! I grew up eating these every weekend with my family, along with bagels and bialys. Everywhere my father travels, he checks in with the local bakeries to see if they make these — he’s determined to find the world’s best. Can’t wait to try the GF version! Hi Edie–Catching up … I’m always amazed at different foods that folks eat all the time that I know absolutely nothing about. Babka and bialys would be on that list, but now I’m very intrigued. And if a man has to have a quest, your dad’s is not a bad one at all. 😉 Please report back when you make the gf version! As I was just saying in another comment, one person already reported back (somewhere) that she’d made Brittany’s recipe, that it was easy to do, and that her family loved it! Thanks for all that you do, and share! I refer people to your site frequently, as I can honestly say that all your recipes have turned out well for me. This holiday event is such fun!